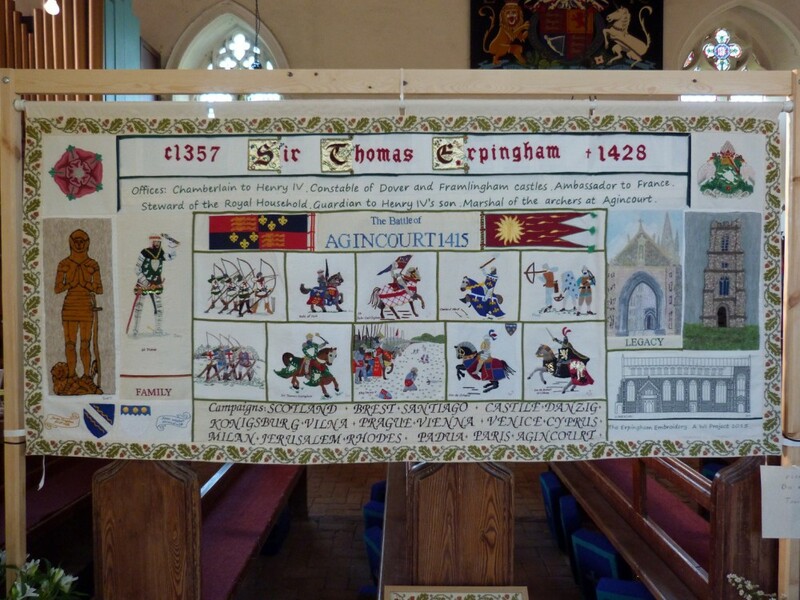 Below are described some of the interesting features in Erpingham Church. For a more comprehensive tour see the church ‘walk around guides’ in the church itself. 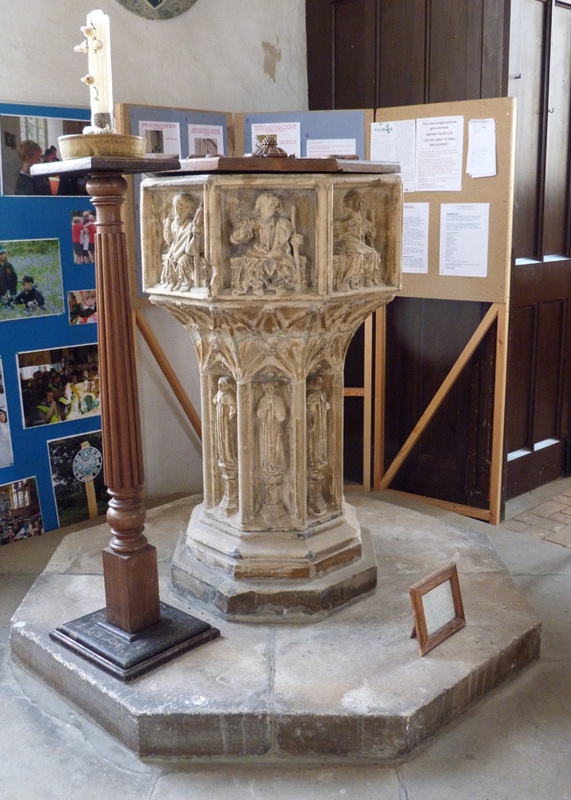 The Font – This font is from St. Benedicts church in Norwich which was bombed during the war. It replaces one which was in front of the vestry door and was destroyed when large stone figures fell from the tower through the roof in a storm. These can be seen in The South Aisle. The Iron Chest – This 13th 14th Century chest once housed the altar plate and wine but is now filled with Christmas decorations. It is barrel lidded and metal bound with three locks – one for the priest and two for the churchwardens. It was restored and put on an oak cradle in 1983. 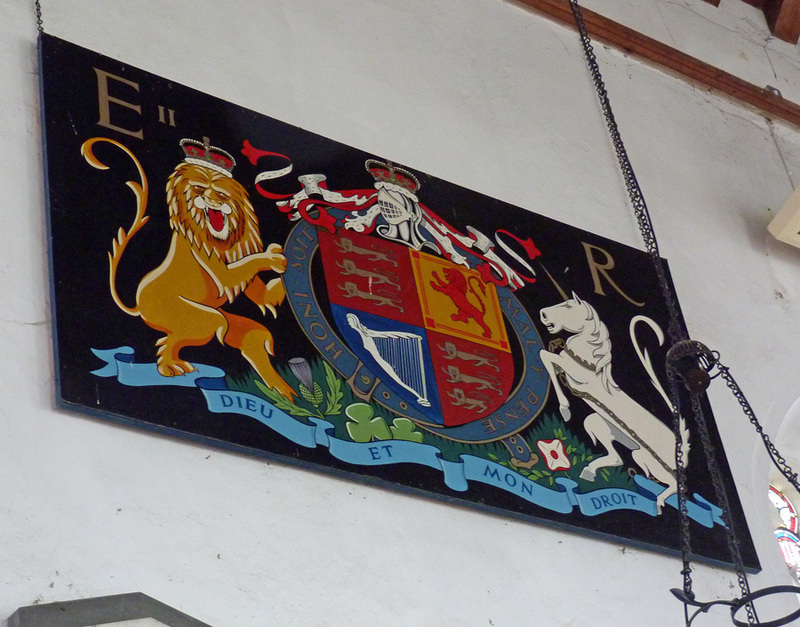 The Erpingham Flag – made by Mrs Penny Knee it is similar to one in Norwich Cathedral. The birds around the edges are called marlets. One of the main gates to the cathedral in Norwich is called the Erpingham Gate. Brass of Sir John Erpingham – laid in the South Aisle by his son Sir Thomas Erpingham who led the archers under John of Gaunt at the Battle of Agincourt. Statue of the Virgin Mary and Child. This was donated by Nicolas Corbin (a former Churchwarden) in memory of his 1st wife and daughter who were tragically drowned in the sea at Bacton. There are several other statues around the church donated by a previous rector Revd. Raby. Stained Glass windows – see a separate page. There are several good stained glass windows but note in particular the East window with a copy of a window in Blickling Hall.